Through 9/29: Wed-Sat 8 PM, Coach House Theater, Berger Park Cultural Center, 6215 N. Sheridan, elgrandedecocacola.com, $40 general admission ($20 Wednesdays), $60 (includes buffet dinner and open bar Thu-Sat from 7 till 8 PM). 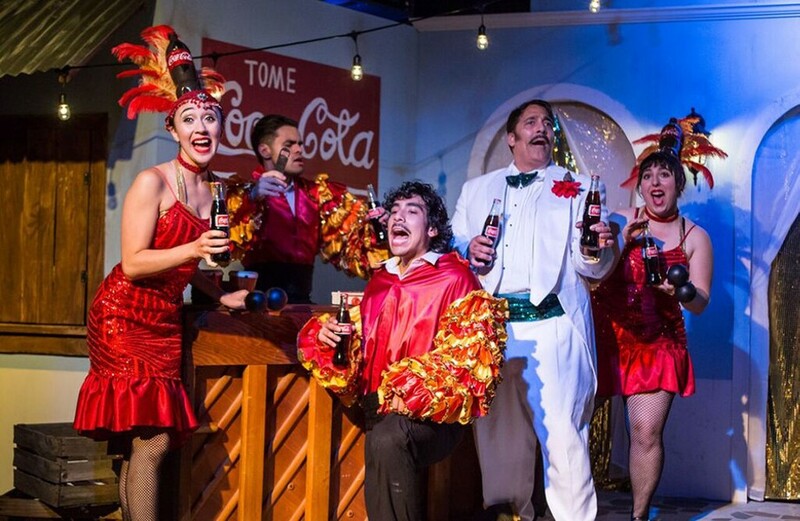 When the talent booked to headline a Coca-Cola-sponsored Mexican cabaret concert blows it off last minute, it's up to the beleaguered host, his three semi-talented children, and a fifth guy who just sort of hangs out at the cabana to rescue the night's entertainment. But the show must go on, and we witness several examples of the bad lengths to which Señor Pepe Hernandez (Johnny Garcia) will go to salvage his big blowout and its munificent corporate funding. There are Coke-bottle headdresses, a heated dance battle for the grand prize of a fresh Coke, Cokes gifted to the audience, and even mimed live-action Coke commercials staged on an invisible beach. What this oddball play from Waterfront Cafe & Summer Stages finally amounts to, then—not counting the yummy taco dinner beforehand for full-price attendees—is just over an hour's worth of ironic dysfunction and broken scenes from a talent show gone haywire. At its worst the flubbed bits simply pile up, with not a comedic button in sight. But then there's the hanger-on Juan Rodriguez, played by Richard Gomez, whose giddy pratfalls and big goofy mouth perpetually agape dominate the show's best scenes. Whenever he's on, the cringe factor subsides and the piece becomes what it was meant to be: a low-stakes romp for funsies.